My submission for the Ultimate Blog Challenge, July 2014. This month I plan to write about blogging and writing books in the form of haiku (You can learn more about how to write a haiku poem here). This is my humble attempt to learn this writing technique and I would love to share my hits and near-misses with you all this month in the UBC. Lovely… I like the happier note in this one. That is beautiful – very evocative! Thank you for sharing. You reminded me today of my old garden where I had planted a lilac bush and lots of lavender too 🙂 Now I miss it so much. Oh lovely. 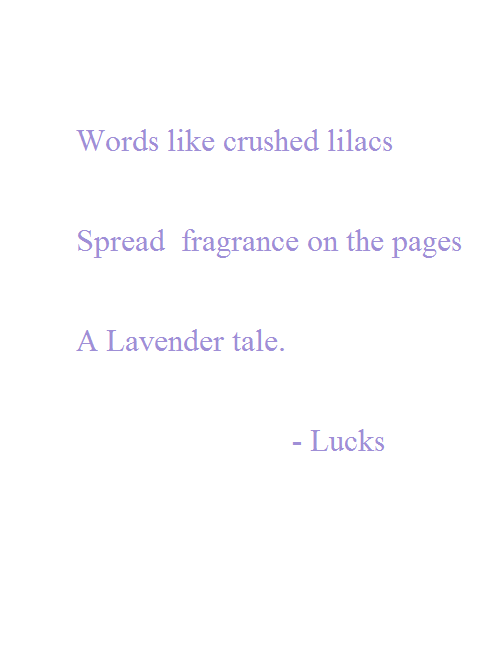 I like the idea of words being fragrant; I love the smell of lavender. MMM, I can practically smell the scent of lavender and lilacs. Lovely haiku!